Hagen CAT it carbon filter  - HKD70 : PetPetMaMa , The Best Products for our pets! 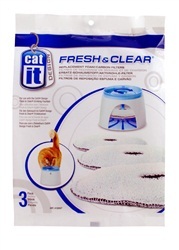 The Catit Design Fresh & Clear Replacement Foam/Carbon Filter is for use with the Catit Design Fresh & Clear Drinking Fountain for Cats (Art. # 50053). This dual-function replaceable filter helps to collect debris, food and sediment, as well as helping to reduce bad tastes, odors and absorbing impurities present in tap water. Package of 3.